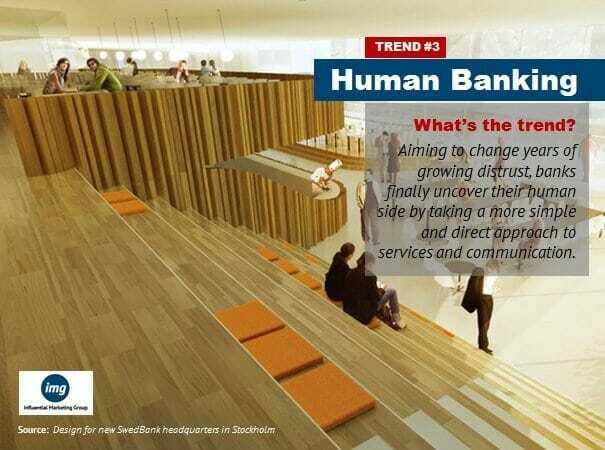 Finally changing years of growing distrust, banks finally uncover their human side through simplifying their offerings and changing the tone of how they communicate. After years of negativity, brands in the financial sector are finally beginning to rebuild trust and even inspire loyal customers by taking a more simple and direct human tone in communications, and removing the manipulative fees and inhumane customer service that led to so many of the problems in the first place. Anyone working in the Financial Services or Insurance sector, as well as highly regulated industries with high brand or industry reputation problems such as Big Pharma and Government. Also, the rest of us who interact with these institutions for our personal and business banking needs.